The AWOS on field at Manassas read -6C / 21F at 7:15 this morning, about the time that I got the keys to the airplane. We've been spoiled in Northern Virginia with a mild Fall, and this was the coldest I've been out flying so far. I was grateful that they put the plane in the hangar overnight--I bet starting the engine would have been difficult, otherwise. Two shots of the primer and it started on the first attempt. I am trying to fly as frequently as possible to get prepared for the checkride. This morning, I was on a solo mission to knock out steep turns, stalls, slow flight, and some pattern work. The airplane climbed like a rocket in the cold morning air. I lowered the nose and climbed out above the best-rate-of-climb airspeed so that I could see ahead of me. 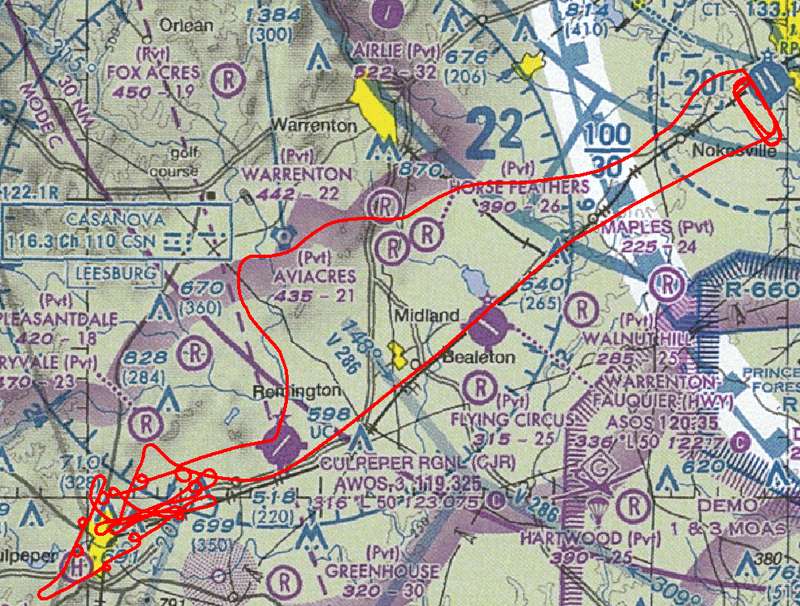 I tracked to Casanova (CSN) VORTAC and then climbed to 3000 feet when well clear of the Dulles Class B airspace. No sense in getting intercepted by F-16s like the student pilot out of Warrenton experienced last week. My steep turns were still a little sloppy. I was trying to hit altitude, airspeed, and heading exactly using the mountains as visual references. Airspeed and altitude control was better but my heading control needs work. I had been practicing these more as instrument maneuvers up to this point, which I now realize is not the preferred way to do them. I used 90 knots as an entry speed, and I found that with just one in the plane and with the low density altitude, only about 2000-2100 RPM was needed to hold that airspeed in level flight (the very bottom of the green arc). Then I induced a few power-off stalls west of Culpeper airport. Today I was trying to enter a Vx (best angle of climb airspeed) ascent immediately after recovering from the stall to simulate being low to the ground. I forgot to retract the flaps to 20 degrees immediately after recovery, so I did a few more to drill that into my head. I tried to remember the enroute cruise and descent checklists, but it turns out that they weren't printed on the skinny laminated card in the plane. I might need to make my own checklist sheet which includes them. 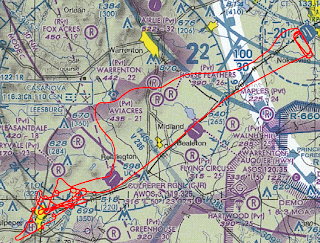 I flew back to Manassas to do pattern work, paying close attention to descend below the Class B airspace and then to traffic pattern altitude so as to maintain a leisurely descent rate of 500 feet per minute. Manassas Tower gave me a base entry for runway 34L as usual. I was experimenting with different power settings to do a constant 500 fpm power-on descent in the traffic pattern as was suggested during the last stage check, only I didn't have the room. On final, I was power-off with full flaps and still high. I tried a forward slip but couldn't get it sorted out, so I went around. I suspect my CFI has been silently helping me with those, so now I really need to practice them. Manassas tower had me change my transponder to the SFRA pattern work code (1234) before I made the crosswind turn. I set up again for a steep power-off approach with a really short base leg. I need to work on widening my patterns just a little bit. I touched down before the stall horn went off, so I decided to taxi back and try again. The next landing also could have been held off longer. I've realized that I still have a lot to work on before the practical test. I'm going to focus on flying these maneuvers more precisely in the next lesson.